The Marlins traded away most of their best players a year ago, and after dealing away C J.T. Realmuto this off-season, things can only get worse from here. The hole Realmuto left behind should outweigh the upside of Miami’s younger players, for now. The Marlins did add a couple veterans to the lineup and signed a new closer in Sergio Romo. Plus, the bulk of the prospects acquired from their recent rebuild should be making their way up as 2020 and 2021 approach, and when that time comes, this team will be on the rise again. But for now, they remain in the NL East basement after a rough 2018. It was not easy coming up with something here. A lot has gone wrong in Miami in the last year and a half. But I think the bright spot of this team is the top of the rotation. Jose Urena, Miami’s longest tenured player, leads the group, with seasoned veterans in Wei-Yin Chen and Dan Straily behind him. Straily has had a lot of success with the Marlins, and when Chen is healthy, he shows flashes of dominance. 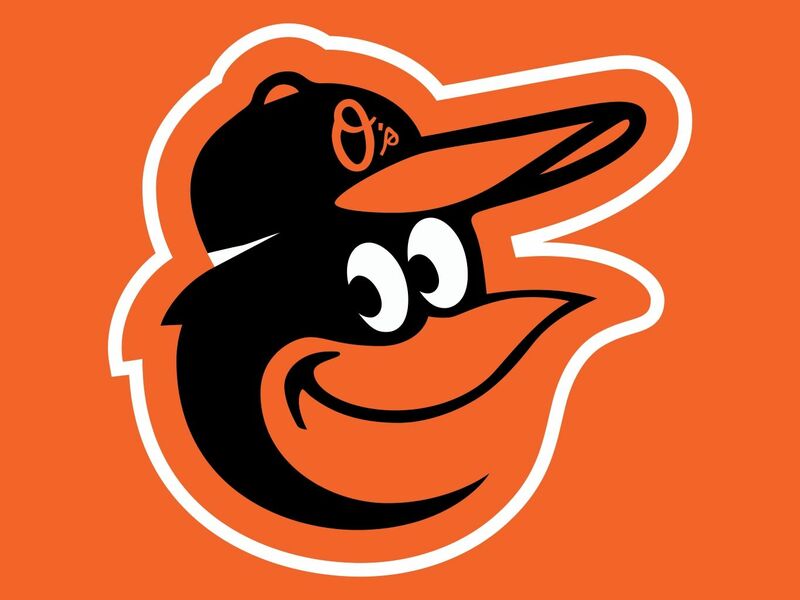 Baltimore’s 2018 season was historically bad, as they won just 47 games. But with Dylan Bundy and Alex Cobb (likely out of it early in 2018 after lack of Spring Training time) primed to bounce back, they should improve at least slightly from their nightmare season. Adam Jones’ departure hurts, but Cedric Mullins is ready to replace him, and Yusniel Diaz will be here soon. Maybe Chris Davis can even rise to the occasion with Jones out of the lineup. The bullpen is still a major concern, and the lineup could be better, but I don’t think we’ll see any team perform worse than the 2018 Orioles for a long time. The rotation could be better, but so long as Bundy and Cobb bounce back, the rotation could potentially be a bright spot for this team. Bundy and Cobb could provide Baltimore a 1-2 punch, with Andrew Cashner and Nathan Karns among others serving as depth. Detroit’s rebuild kicked into full swing in 2018 after they dealt away several older players at the 2017 Trade Deadline. Their remaining veterans, even Miguel Cabrera, are declining quickly. This rebuild has dragged on for a while now, leaving the Tigers among the league’s worst teams for a third straight season. Even in a weak division, I can’t see them doing much. Before they contend, Casey Mize and Matt Manning will need to make their way up and Christin Stewart, Jeimer Candelario, and others will need to make their big break through. In the meantime, it could be a long year for the Tigers despite some new additions to their lineup including Jordy Mercer and Josh Harrison. 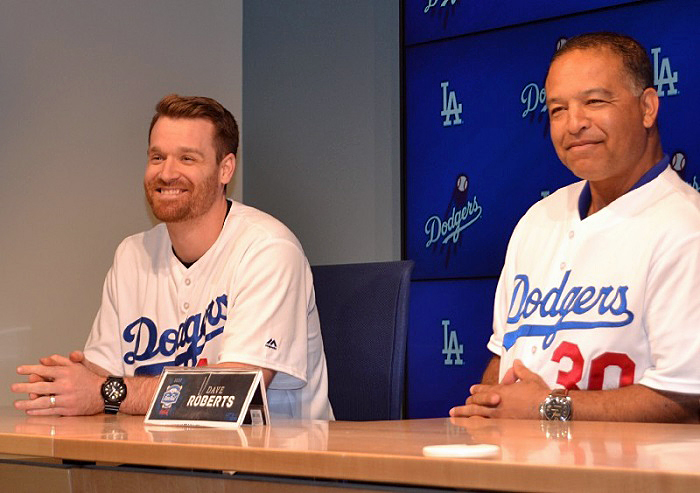 The infield could shine with the additions of Mercer and Harrison. If Candelario continues to develop this year, and Cabrera regains a bit of what he has lost during the last couple of years, people may begin to wonder how the Tigers are stuck in the AL Central basement. The Hosmer-Moustakas era in Kansas City is officially over, with Alcides Escobar leaving in free agency, and Mike Moustakas leaving at the 2018 Trade Deadline. The team still has a capable rotation, but the bullpen lacks the depth it has contained in past years. The lineup may lack power this year with Salvador Perez on the IL and Hosmer and Moose gone, but hopefully, Billy Hamilton’s speed will at least partially make up for it. Even with Hamilton and Chris Owings on board, this team is bound to decline a little bit more before the rebuilding is over. The next crop of prospects is not ready yet, and during this transitional period for the Royals, things could get ugly. Speed and youth will make the Royals special this year. A lot of young players are primed to breakout, including INF Hunter Dozier, RHP Jorge Lopez, and C Cam Gallagher. Hamilton and Gore will make for a dynamic outfield and add speed to an otherwise dull starting lineup. The Diamondbacks declined a bit in 2018 despite minimal roster subtractions. You might think they would bounce back considering their young roster, but after trading away star 1B Paul Goldschmidt, this team is not going far. The lineup lacks big hitters beyond underrated outfielder David Peralta and new addition Adam Jones. The pitching staff is thin behind Zack Greinke and Robbie Ray. In a tough division, the Diamondbacks will struggle this year, as Manny Machado leads the Padres to outperform them, the Giants exceed expectations, and the Rockies and Dodgers sit on top. The rotation may have lost some of its depth. But until Greinke or Ray leaves, the rotation will still highlight this team. Taijuan Walker’s return from the IL will only boost this strong rotation further. Luke Weaver is also underrated and could make an impact. The Pirates exceeded expectations with a sub-.500 season in 2018. But the departures of Josh Harrison and Jordy Mercer (both fled for Detroit) leave a huge hole in the middle infield, and the rotation is extremely top-heavy. The Pirates would perform better with 5 average starters than their Big 3 and little depth behind them. The outfield is this team’s strong point right now, but Gregory Polanco will be missed during his time on the IL. 3B Ke’Bryan Hayes and other top prospects may fix Pittsburgh’s infield problems once they make their way up, and Mitch Keller could make this rotation even scarier. But for now, the Pirates will be stuck on the bottom of a tough division. There are multiple bright spots to consider for this team. But the infield is in such bad shape that it’s hard to rank them much higher than this in such a tough NL Central. The outfield could make things interesting once Polanco returns, as they will own three outfielders who could be considered Top 10 at their positions. The incoming prospects could help accelerate their progress as well. That’s all for Part 1 of my MLB 2019 preseason power rankings. Stay tuned for my next power rankings article, where I will look at the teams I ranked #24-19 and discuss things to look forward too for those teams. Ranking The Teams 30-25, My Version: Who’s In The Basement? Each year since 2014, David Schoenfield has ranked all 30 teams in tiers during the preseason. For the fourth year straight, I am creating my own version. Throughout the week, I will be posting my rankings. However, I started a little late this year due to the MLB’s slow off-season. Today they start with the bottom 6. Friday, March 23: Ranking The Teams 30-25, My Version: Who’s In The Basement? Saturday, March 24: Ranking The Teams 12-7, My Version: Who Will Contend in 2018? *I will also have my latest Baseball Bits coming this Sunday or sometime next week. The Marlins underwent a complete overhaul this off-season. They traded four key pieces from their lineup last year: Christian Yelich, Giancarlo Stanton, Marcell Ozuna, and Dee Gordon. Those guys were leaders for the Marlins. They could have gone on to contend with that group, but after no success making the playoffs in recent years, they decided to fully rebuild. Rather than signing a couple pitchers and going for an NL East title, they decided not to sign too many pitchers and to make the series of trades they made. In these trades, they added members of their future core, such as Lewis Brinson, Monte Harrison, and Magneuris Sierra. They also acquired Starlin Castro to play second and signed a veteran or two including Cameron Maybin to be placeholders in the new look outfield. These trades further advanced teams like the Yankees, Cardinals, and Brewers as well. The Marlins have no intention of contending in 2018. This year, expect to see veteran placeholders make up the lineup alongside their more seasoned prospects like J.T. Riddle and Lewis Brinson. In the meantime, the Marlins will be getting their next generation of players ready to play at a big league level. Starlin Castro was only acquired as a veteran mentor, don’t think he’s a sign that the Marlins aren’t ready to rebuild yet. They are in full rebuild mode. But did they rebuild too early? Could they be contending down the stretch rather than sitting in the basement of the NL East, waiting for their prospects to further develop, and carrying around a bunch of older veterans who are past their prime? The Marlins may have overhauled most of their lineup, but they still have a couple strong pieces in catcher J.T. Realmuto and first baseman Justin Bour. Their lineup will remain their strong point in 2018, especially the very core of it. Their rotation needs work. They may have a couple good pitchers, but they need to find guys within their system who can lead the next generation of pitching in Miami. They have plenty of hitting/fielding prospects already making their way towards the majors. Best Case Scenario: The veterans Miami has signed are consistent and show signs that they still have what it takes to be as successful as they were earlier in their career, and Miami’s prospects get called up quickly and thrive in the majors, leading the Marlins just over 70 wins in Year 1 of a rebuild. Worst Case Scenario: Miami’s top prospects struggle at the major league level, and their veteran leaders fail to find momentum, as the Marlins lose 100+ games. As they plan to let a strong group of prospects lead the team in 2018, the White Sox were relatively quiet this off-season. They added Wellington Castillo after several young catchers failed them, and they added a few guys to their bullpen. They also signed Hector Santiago to top off the rotation. But for the most part, they are happy with their young roster. Sure, they could’ve added a veteran leader in the outfield or at third, or even added a new ace, but they can manage with the roster they have, especially if their younger players begin to break out. 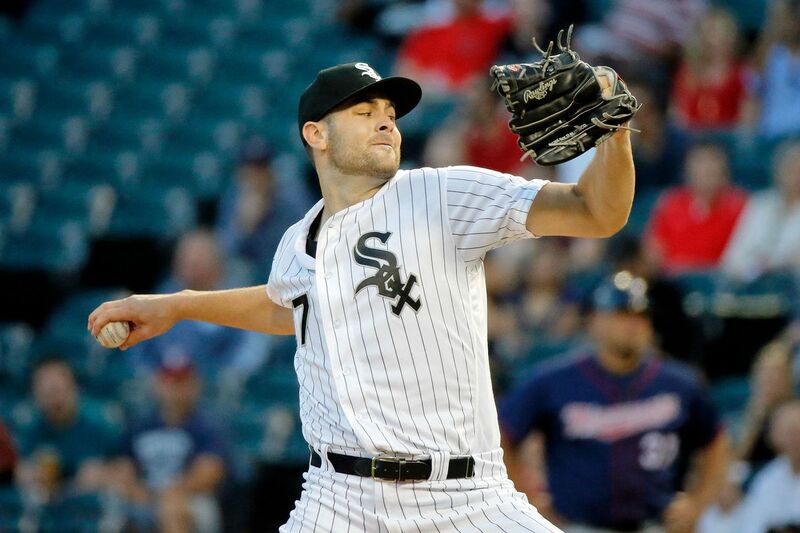 After a rebuild, the White Sox are ready to take steps back towards contention. They will start off slow, but they will improve over the next few years, slowly but surely. Guys like 2B Yoan Moncada, SS Tim Anderson, and CF Adam Engel are hoping to have strong seasons and help lead the team. Meanwhile, guys like Eloy Jimenez, Michael Kopech, and Lucas Giolito are looking to make an impact at the big league level. This year will be about finding young leaders to help lead the team in the future alongside veteran 1B Jose Abreu. I could see Giolito and Engel having strong seasons. It’s younger players who are looking to become the new faces of the team. But in the meantime, the White Sox have some strong veteran leaders. Expect Jose Abreu to build upon a strong season. I could also see James Shields bouncing back to lead the pitching staff and become a mentor for young pitchers like Kopech and Giolito. Also, keep an eye out for younger breakout players. Who do you think will emerge as a star on the White Sox in 2018? Best Case Scenario: Chicago’s strong group of prospects are successful in the majors very quickly and lead the White Sox to a decent year in the AL Central alongside their veteran influences, who have very strong seasons. In this scenario, they would come in 3rd over Kansas City and Detroit. Worst Case Scenario: Jimenez, Kopech, and others fail to succeed at the major league level, and Abreu and Shields begin to decline quickly as the White Sox crumble. The Tigers started off 2017 expecting to contend. But injuries and old age caught up with them, and they ended up trading away their older players and heading into rebuild mode. They still held onto Miguel Cabrera, Nick Castellanos, Jose Iglesias, and Victor Martinez though. Those four will mentor the younger players taking over, like Jeimer Candelario and Dixon Machado. 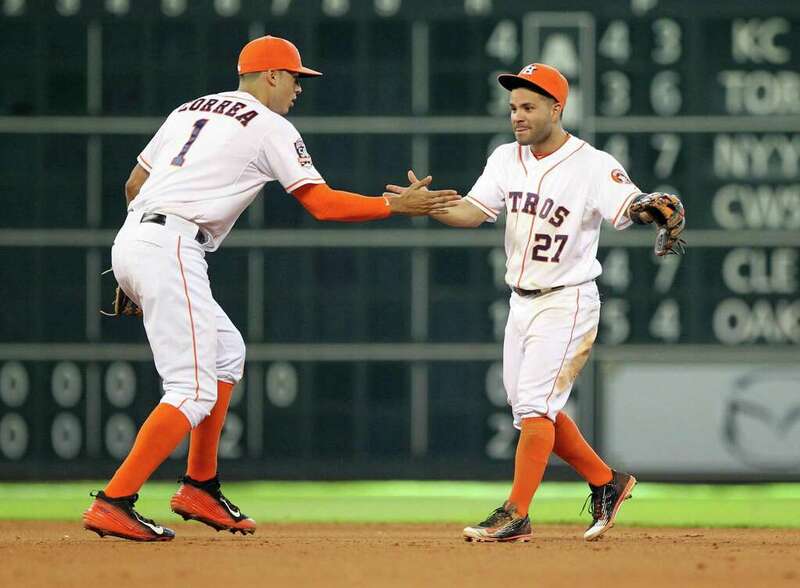 They could’ve used another veteran infielder, but instead, Candelario and Machado will start full time, and the only major free agent signings by Detroit were signing OF Leonys Martin and SP Mike Fiers, both of which they got done much earlier in the off-season than most of the free agent signings occurred. Meanwhile, veterans Jordan Zimmermann, Francisco Liriano, and Mike Fiers, as well as younger starters Michael Fulmer and Daniel Norris, will headline the new look rotation. The Tigers don’t have any blatant holes on their roster, but their roster lacks upside. They have a lot of average players, but no clear superstar. 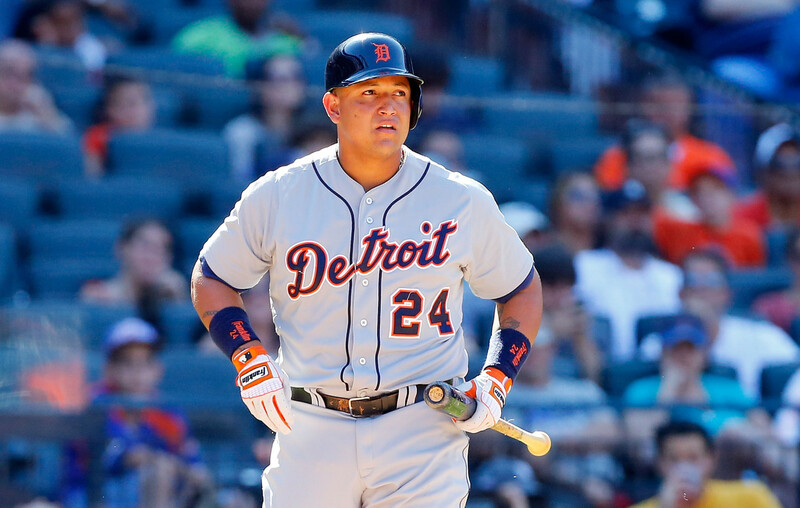 Even Miguel Cabrera’s numbers have taken a dip from dominant to average. The question is, can Miggy rebound and lead this young team in 2018? The Tigers will need someone to step it up and emerge as a true leader. They have a good amount of veteran mentors, but nobody who can carry the team. Who will break out and emerge as a star for them? Like I said, it’s hard to name one leader or bright spot on this mediocre team, and mediocre teams with a lack of a leader and few experienced players are known to struggle. I see Miggy and Victor Martinez rebounding for strong seasons and emerging as leaders. Once the Tigers can find themselves a leader, they could be going places, as the younger players follow in their footsteps and help bring the Tigers back to the playoffs a couple years down the road. Best Case Scenario: Detroit’s young roster gets off to a hot start, the well-balanced rotation thrives and Miguel Cabrera bounces back to lead the team as the Tigers jump right back into third place in Year 2 of a rebuild. Worst Case Scenario: The rotation cannot find an identity, Detroit’s younger players struggle and disappoint, Miggy continues to struggle, and nobody else steps up to lead as they end up in the American League basement. In 2016 and 2017, the Pirates found themselves stuck in the middle. They had a strong, but declining lineup and a rotation that was beginning to collapse. This off-season, they made a definitive choice to begin a rebuild, and they started by trading Andrew McCutchen and Gerrit Cole, their best hitter and their best pitcher. After that, their off-season was very quiet, and Spring Training will be focused on getting their young prospects ready to play every day in the MLB. 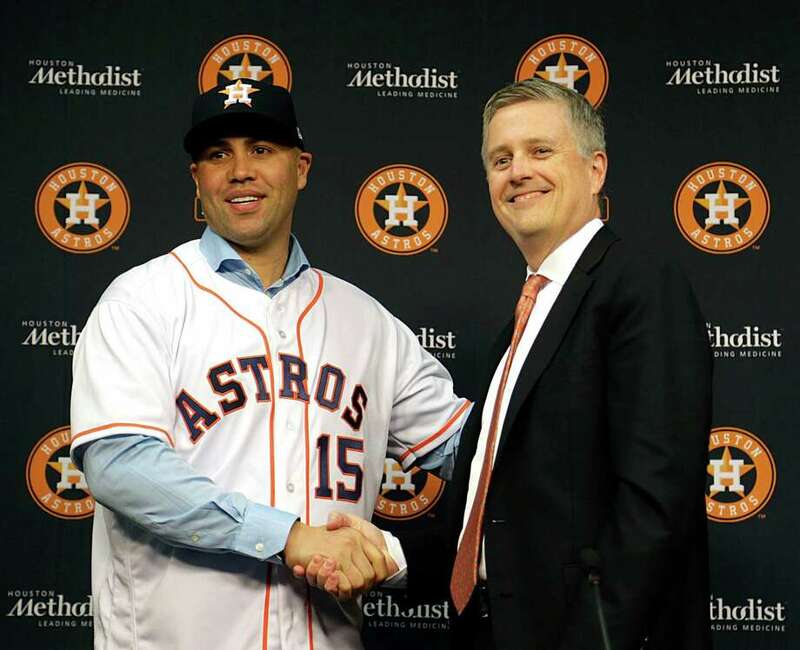 They got some of those prospects as a return from the Astros (who acquired Cole) and the Giants (who acquired Cutch). That group includes RHP Kyle Crick, RHP Joe Musgrove, and 3B Colin Moran. The Pirates have made it clear what direction they’re headed in, and they will not contend in 2018. They have some nice pieces that will help them alongside their top prospects in the coming years, but right now, the veterans are just there to keep the Pirates playing at a major league level (at the very least). In the meantime, the Pirates will focus on getting their prospects ready. Expect to see a lot of Austin Meadows, Colin Moran, Jordan Luplow, Josh Bell, Bryce Brentz and Max Moroff in the Pirates lineup. All those guys are potential leaders for the next generation in Pittsburgh. Meanwhile, their biggest need is a successful young pitcher. They have yet to find one, but as soon as they do, expect to see him up in the majors getting a chance to prove himself. The Pirates still have a decent lineup, so if they can get a few young hitters ready and fix up their rotation, expect to see them back in the playoffs in a few years. The Pirates still have a great group of guys in the outfield. Not only do the Pirates have some good defense out there, but these guys will continue to lead the Pirates lineup. 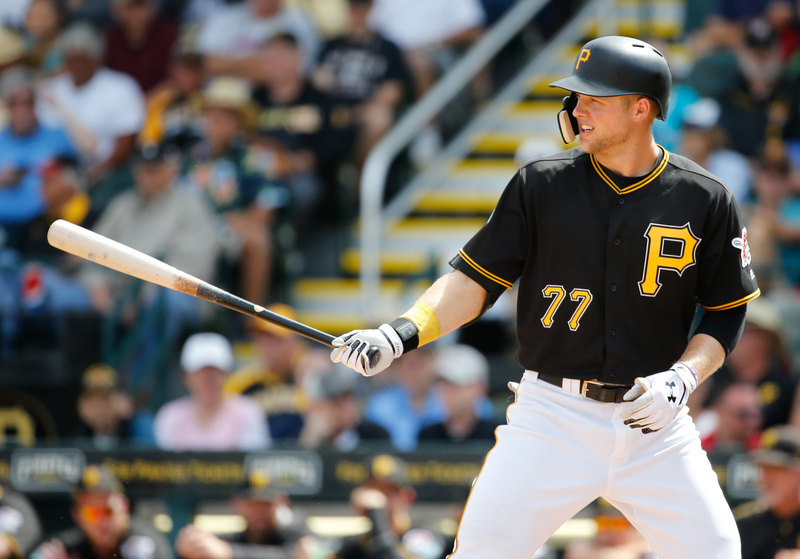 Despite trading away Cutch, they have brought in Corey Dickerson, another power hitting outfielder to replace him. They also have plenty of prospects who will see time back there including top prospect Austin Meadows. Starling Marte and Gregory Polanco will also continue to serve as leaders on this team. Their rotation may need work, and the infield has yet to find their starting mix, but this Pirates outfield is all set. Best Case Scenario: Pittsburgh’s prospects crack the majors and make an impact quickly, Polanco and Marte continue to serve as leaders and mentors, and the young rotation looks a little better as the Pirates get right above the 70-win line. Worst Case Scenario: Injuries and struggles plague the Pirates rotation, Pittsburgh’s veterans decline, and the prospects are forced to lead the team and fail to handle the pressure as Pittsburgh collapses in Year 1 of their rebuild. Last season I said the Padres were in a horrific rebuild after making a mistake in signing a bunch of veterans past their prime to lead the 2016 team and some of you disagreed, saying that the Padres have talent that will anchor their next generation. Whoever said that is correct because now that the Padres have gotten their top prospects MLB ready, they are ready to take steps back toward contention mode. Manuel Margot and Fernando Tatis Jr. are some of the young guns who can help lead this team, and the Padres have added a couple veterans to further boost the roster. They may have made the biggest signing of the off-season when they added 1B Eric Hosmer. They also acquired SS Freddy Galvis and 3B Chase Headley (who was here to start his MLB career) after giving up infielder Yangervis Solarte. Wil Myers will also continue to be a veteran mentor as he returns to the outfield. He will allow San Diego’s younger outfielders to platoon, and they will not be pressured to perform like everyday starters. After a brief rebuild, the Padres are headed back in an upward direction. But legitimate playoff contention will take a year or two. This year, their young roster will continue to develop as their veterans lead the team in an upward direction. Once guys like Carlos Asuaje and 19-year old prospect Fernando Tatis Jr. are ready to contend alongside Hosmer, Myers, and co., the Padres will be going places. 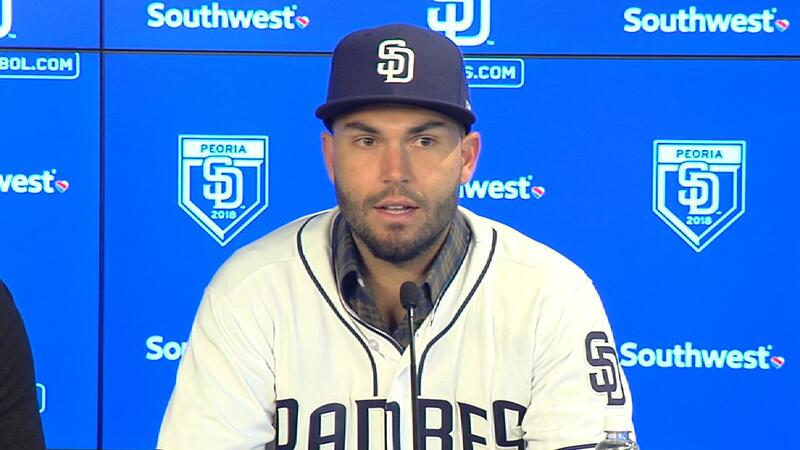 In my opinion, Hosmer will emerge as a leader, star, and mentor on his new team. With the Royals, Hosmer was never a sole leader or the face of the team, but he was on the brink of stardom as he continued to thrive in Kansas City. In San Diego, he will emerge as one of the league’s premium position players as he leads the team and emerges as a superstar. He is already an All-Star Game regular, but he hasn’t received the love and respect he deserves. Now that he’s arguably the best player on his new team, he will completely breakout, and the league will recognize that. Best Case Scenario: With an upgraded, well-balanced roster, the Padres will get off to a fast start and compete in the NL West. However, in what’s arguably the toughest division in the league, they will not see the playoffs quite yet. Worst Case Scenario: San Diego’s prospects disappoint in their first years, and the Padres fail to find leaders and mentors in their veterans, which will further affect the young guns as the Padres end up in dead last after they cannot handle the pressure of their division. Other than that, Oakland was pretty quiet this off-season, and it will not hurt them. They didn’t need to do much to keep the roster in good shape. But they will not contend yet. That all depends on when guys like Matt Olson, Matt Chapman, and A.J. Puk breakout. Like I said, the A’s are on the brink of contention, but they need a breakout star or two first. They have a lot of great young pieces, and they are headed in an upward direction now. They have a home run hitter too. But they need a couple younger players to lead the A’s if they want to get back to the playoffs. I don’t care who. It could be Matt Olson, Sean Manaea, Matt Chapman, Andrew Triggs, anyone. I could personally see Manaea or Triggs breaking through, and I also like Olson and Chapman. A.J. Puk is also a breakout candidate. Although I do not have the Athletics contending this year, they could be in a great position by Opening Day 2019. 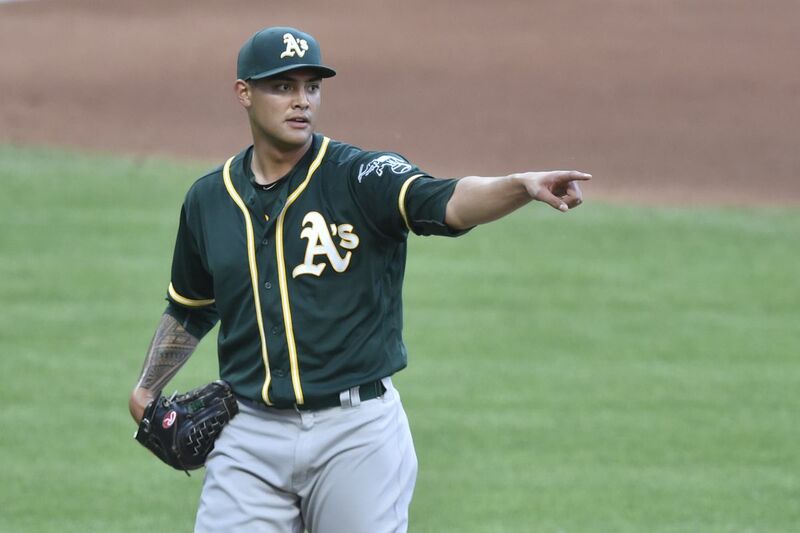 The A’s may not be contending yet, but if they can combine rotation and lineup consistency with the power hitting core they already have, they can make a run at the playoffs. Khris Davis was one of the Top 5 HR hitters of 2017 (the top three are now all part of the AL East). Yes, only Giancarlo Stanton, Aaron Judge, and J.D. Martinez hit more. I see Davis repeating this over the next couple years, and combining that with Oakland’s flurry of young talent on the brink of a breakout could make for great things. The future is very bright in Oakland. 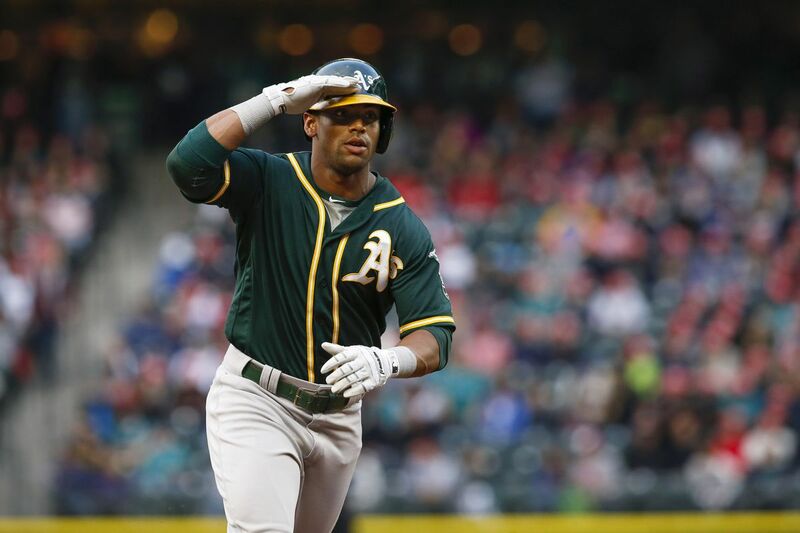 Best Case Scenario: Davis continues to keep up with the best in the power-hitting department, many of Oakland’s younger players break through, and the A’s jump right back into contention with a record around .500, putting them in great shape for 2019. 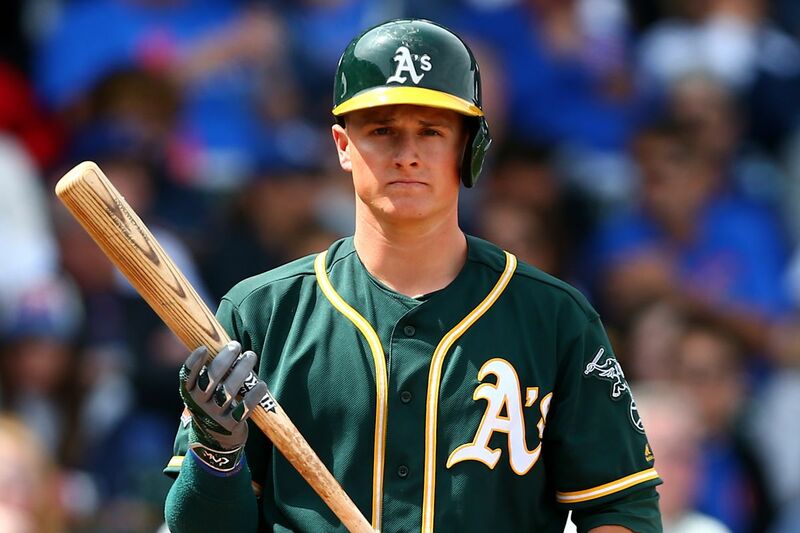 Worst Case Scenario: Davis drops off, the rotation is plagued by injuries, and nobody emerges as a leader/star as the A’s disappoint and bore many in 2018. Note: Although I see a lot of potential here, they need to prove themselves before I can rank them too much higher. That’s all for this article. Stay tuned for Part 2 coming soon. I will also have my preseason Baseball Bits up before the regular season begins next week. On a side note, I was unable to finish my March Madness previews, but my bracket is busted anyway, and you can click here for my second chance picks. Also, stay tuned for my update on NFL free agency. 3-3 ballgame. It was the bottom of the 8th, and ex-Red Sox pitcher Alex Wilson was on the mound. It was high in the air. I knew it was gone the minute I saw it. 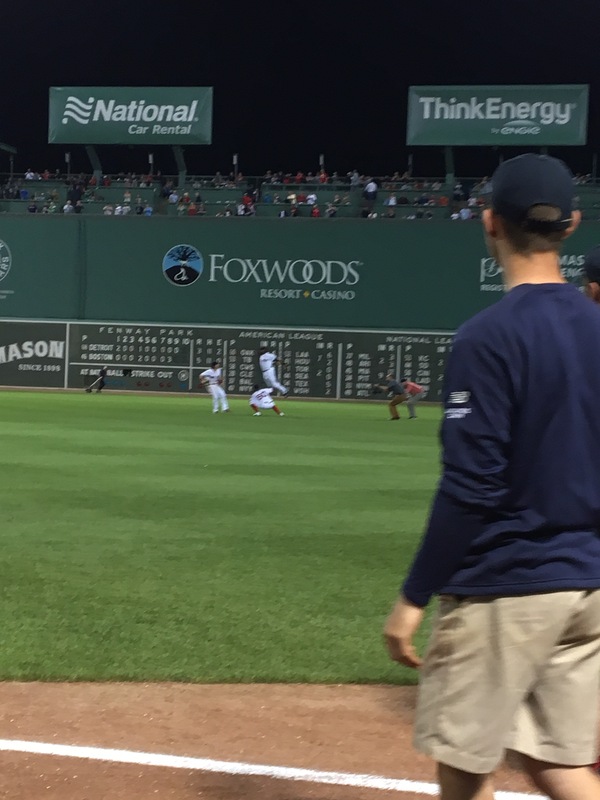 JBJ had just nailed a go-ahead home run to give the Red Sox the 5-3 lead. 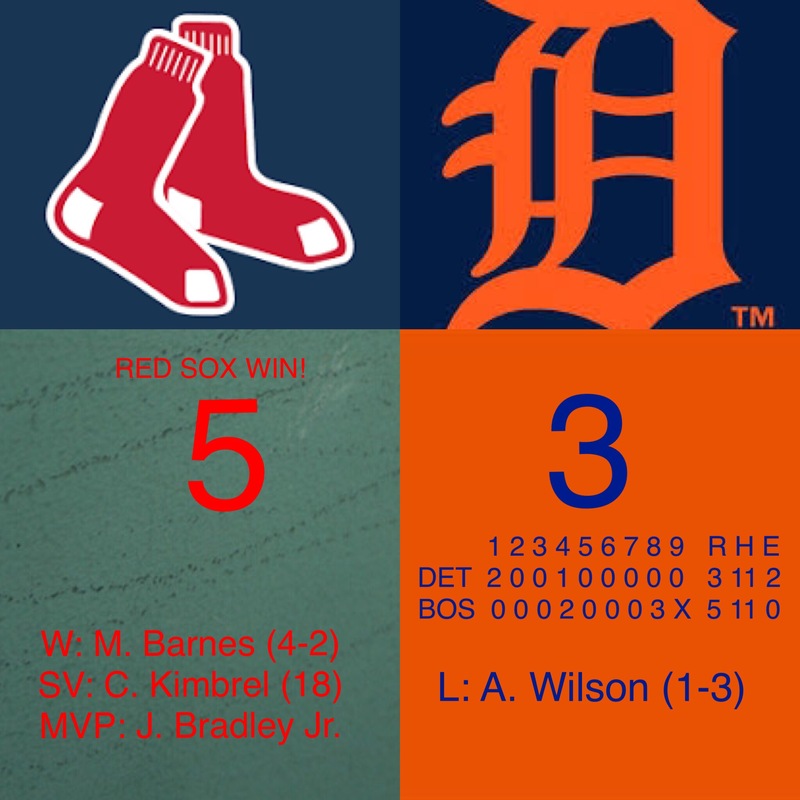 The Red Sox went on to top the Tigers 5-3. Each team got 11 hits in this big hitting game. Mitch Moreland went 3-4 with 2 RBI, JBJ went 2-4 with another 3 RBI. 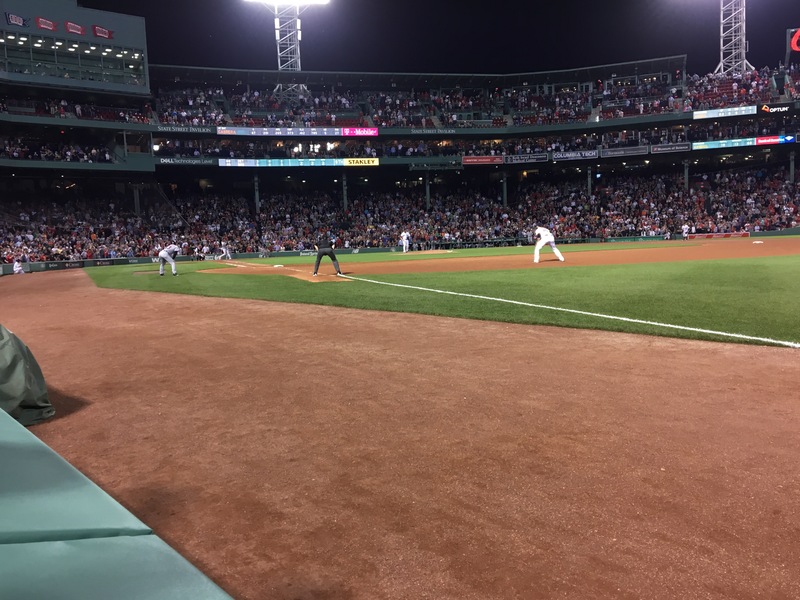 Lots of good plays by JBJ and Mookie Betts made the game interesting and I was at the game and witnessed the great comeback victory. It started out ugly for the Sox though. Brian Johnson gave up a dinger with 1 out in the 1st inning to Nicholas Castellanos. But the Tigers weren’t done. Both Victor and J.D. Martinez got on base, and it was 1st and 2nd with 2 down. Then Justin Upton knocked Victor Martinez in with his single up the middle. It was 2-0 Tigers after 1 inning and Brian Johnson had thrown almost 30 pitches. Johnson tried to settle down after that, but in the next two innings he reached 70 pitches. He had given up 5 hits and a walk in 3 innings. Then to begin the 4th, Mikie Mahtook nailed a dinger into the bleachers. 3-0 Detroit. 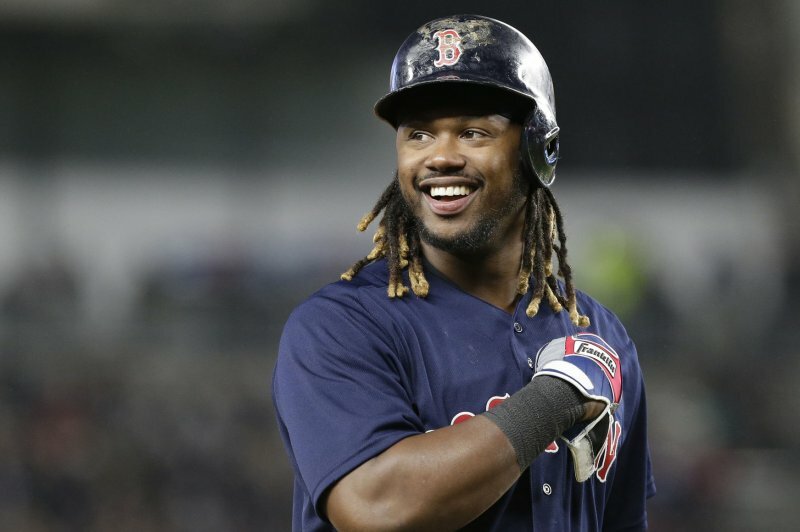 However, the Red Sox began to rally in the 4th inning. Mitch Moreland answered with a leadoff home run to center. Then after a Benintendi single and Ramirez walk, it was 1st and 2nd. Then Bradley Jr. hit a line drive single to knock in a 2nd run. 3-2 Tigers. However, Pablo Sandoval ended the rally on a double play. Panda struggled all game, striking out twice and grounding into this double play. He also made 2 plays that could’ve been called errors. The Tigers tried to strike back. Victor Martinez got a base hit, and then J.D. Martinez doubled to center and Victor was on third, but it wasn’t enough. After Brian Johnson and Heath Hembree were done, Joe Kelly was an absolute machine against Detroit in the 7th. Mookie Betts tried to start another rally when he doubled, but it failed. However, the Red Sox came back in the 8th. Alex Wilson, the former Red Sox player, was pitching. Fans were booing and taunting him. Bogaerts got on base, and then he reached second when Wilson wildly tried to pick him off at first. Then Moreland drove in another run with an RBI single. It was a tie ballgame, 3-3. Benintendi lined out, and Ramirez was out on a lazy fly ball. Then, JBJ hit a huge dinger to right. Everyone was cheering. They had come back! The Red Sox were up 5-3 going into the top of the 9th, and Craig Kimbrel came right into the game. 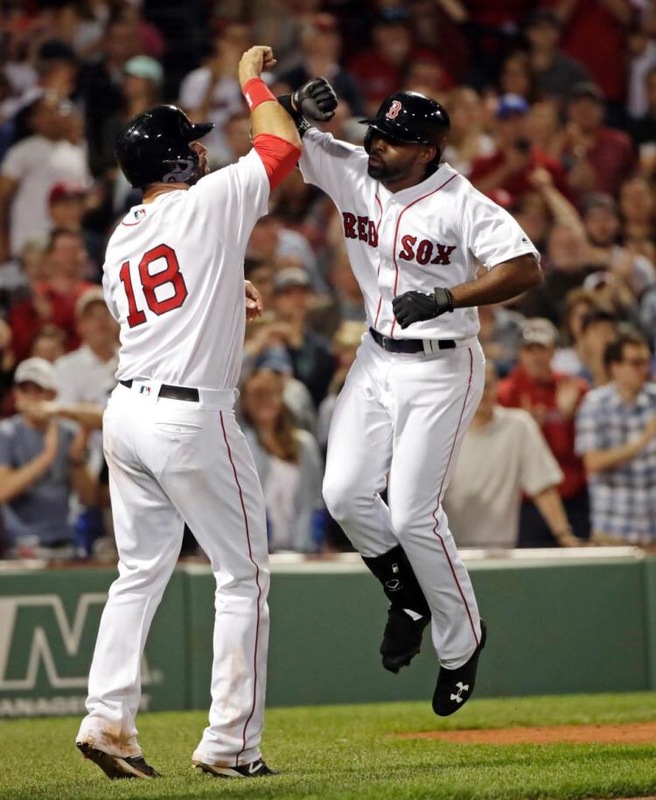 After a strikeout, a foul pop up and another strikeout, the Red Sox won 5-3. Kimbrel got the 3 out, 10 pitch save. Here’s the final strike. My good luck may have factored in again. I even got a picture of the win dance, where JBJ was honored. They did their ski jump and I got it on camera. Can they get into a good stretch after a big win tonight? Chris Sale starts tomorrow and it should be a rude awakening for Detroit tomorrow night.